Even being of full Irish heritage, as both a first- and third-generation Irish American, I’m embarrassed to say that I seem to forget to acknowledge St. Patrick’s Day. For shame! But in New York City, there are many reminders of the legacy of the Irish around me. Along with St. Patrick’s Day Parades and Irish pubs throughout its five boroughs, there are noted locations that can put you directly in touch with Irish culture and history – all the way up to the present day. Here is my list of suggested places to learn more about the Irish in New York City. While most of these locations can be seen by the general public, it’s best to check their websites for hours of operation and ticket prices. From 1892 to 1954, 12 million immigrants came through this immigration inspection station, arriving via boats. Did you know that the first passenger to be processed through Ellis Island was said to be Irish? Annie Moore, a young woman from County Cork, was that person was initially registered through. Part of the National Parks Service, visitors can head to Ellis Island on daily cruises and walk through its great hall that once had clerks interviewing and inspecting new arrivals. Make plans to spend time in its immigration museum and sign up in advance for a guided hardhat tour, offered through Save Ellis Island, of an area that once functioned as a hospital. As for finding work, the Irish took on various labor-intensive jobs, one of them being as household servants. Between what’s now the Bowery and Lafayette Street, the prominent Tredwell family owned this 19th well-preserved rowhouse on East 4th Street for nearly a century (the last member lived here until her death in 1933 at age 93). While the Tredwells are much discussed, their Irish servants also get attention. Most information known about these four female employees is from census records. However, it’s common knowledge that their hours were long and pay was low, but they definitely were instrumental in running a household. On St. Patrick’s Day 2017, the museum will host guided tours relating to these servants throughout the day, plus a candlelight version at night. Most people know about St. Patrick’s Cathedral on Fifth Avenue in Midtown, but its older cousin is set in NoLita. On the corner of Mott and Prince streets, this minor basilica once surrounded an improved Irish neighborhood but now caters to a multicultural congregation. During the mid-1800s, at a time when Irish Catholics faced much backlash and bigotry, the church got an outer brick wall for protection after an attempted ransacking and the threat of being burnt down. The church’s history also states that young Irish lads from the neighborhood also provided security as a militia that would become New York’s 69th Regiment (also known as the Fighting Irish). 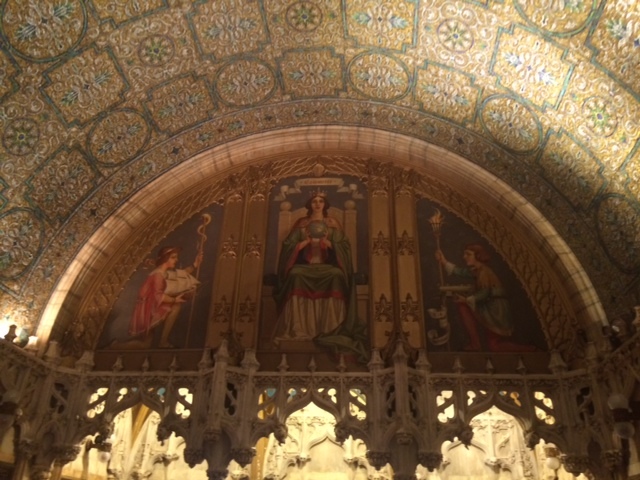 The cathedral has underground mortuary vaults and a cemetery, featuring a who’s who of prominent Catholic New Yorkers from the 16th through 18th centuries. You’ve also may have seen the church in “The Godfather” and “The Godfather Part II” movies. The surroundings of this public park in Chinatown were once adjacent to the Five Points, a rough neighborhood slum known for its portrayal in the film version of the book, “Gangs of New York.” Conditions were so bad here, that photographer/social reformer Jacob Riis made an entire chapter about the Five Points in his book, “How the “Other Half Lives.” At one point in its history, the Five Points had an Irish population that was referred to being the largest outside of Dublin. Other ethnicities that came to live here throughout the mid-to-late 19th century included African Americans, German Jews, and Italians (who would go on establish another neighborhood, Little Italy). In the early 20th century, the area around the Five Points was consumed by a growing Chinatown. The area got some new life too, with plans to replace tenements with trees and flowers within a park setting. A developed green space called Mulberry Bend Park (what Columbus Park was once called) opened in the summer of 1897. Columbus Park got its present-day name in 1911; it’s for Christopher Columbus. Irish culture in NYC goes beyond Manhattan, as past and present communities developed. So definitely put extra money on your subway card for trekking to these areas in the outer boroughs. For starters, The Bronx section of Woodlawn, nicknamed “Little Ireland,” has a hearty Irish population, with pubs like Behan’s Pub and the expansive Van Cortland Park. Queens has Rockaway Park, Woodside, and Sunnyside, and Brooklyn’s got Bay Ridge, Windsor Terrace, and Gerritsen Beach, plus Vinegar Hill has a lengthy Irish history. This entry was posted in Asia, Historic Places, Kenya, New York, New York City and tagged Basilica of St. Patrick’s Old Cathedral, Ellis Island, Irish history in New York, Irish in New York City, The Tenement Museum on March 16, 2017 by She Is Going Places. Have you heard of the term “agritourism”? Find out more by heading to South Street Seaport in Lower Manhattan. EscapeMaker, a company that offers ideas for local and regional trips, has opened a pop-up shop promoting agri-tourism (travel inspired by working farms or other agricultural sties) now until April 24 inside the seaport’s historic Fulton Stall Market on 207A Front Street. Presented by Amtrak, the EscapeMaker Pop Up Shop will be open to the public Thursdays and Fridays, from noon to 6 p.m. and Saturdays and Sundays, from 11 a.m. to 5 p.m. Visitors will find information for planning vacays that will get them out into countryside areas. Details will include ideas for farm escapes, wine and craft beer trails, apple picking locations, and local getaway packages. This entry was posted in Culinary, Delta, New York, New York State, Outdoors, Personal Interests, United States and tagged agritourism, EscapeMaker, New York agritourism on April 1, 2016 by She Is Going Places. As I enjoyed taking in the Winter Olympic sites around Lake Placid, plus spending time around the surrounding Adirondacks’ Whiteface region, I have to say that my dining options were good too. Each place I went to is locally owned and stood out in character, through its menu selections, settings, or backstory. This place on Saranac Avenue is fun and imaginative with a chalkboard wall featuring cool drawings and a counter top seating area that lets you do a little doodling of your own. Candle holders wrapped in birch bark – birch trees are quite common in the Adirondack area – offer a nice touch. Dishes are also inventive. With menus, ‘dack Shack has breakfast, lunch, and dinner choices plus a kids menu and an intriguing theme night menu that lists topnotch orders at a good price point like a confit duck leg at 20 dollars. I was at ‘dack Shack for dinner and ordered the ‘dack Burger, which was stacked with Maple Glazed Bacon, sautéed onions, cheddar and the house specialty secret Shack Sauce (not even my server was told what the ingredients were). To accompany a side of fries, fry dips give ketchup and mayo a step up with flavors like Herb or Truffle Mayo and Dr. Pepper or Habanero Ketchup. Starters are also not your ordinary apps, like breaded mac ‘n cheese balls, and a roast beet, cauliflower and kale dip with crostinis. On a side road near Main Street, this three-floor pub and restaurant serves up about seven microbrews and holds brewery tours of its facility from the top level. The Downstairs bar that you first enter into is an Irish pub setting, while second level is more of a micropub with wall art featuring college sports team banners that would make any fan want to sit in here. Also on the third floor, there is seasonal outdoor deck seating overlooking Lake Mirror. As for the beers, its suds extend to English ales likes its popular fruity and malty dark Ubu Ale, to German wheat brews such as the light German Kristalweizen. With food, it’s bar-style selections but with some nice standouts like craft sandwiches, soups, salads, and an assortment of apps. I had the Maple Melt, a charbroiled chicken sandwich with a New York-sourced cheddar that’s nicely melded together. This Main Street eatery also has lunch and dinner picks, but its name totally reflects breakfast in all capacities. A full service bar and restaurant, this venue has an all-day breakfast menu, so if you’re craving a morning-style meal in the afternoon, you’re good. Known as BC originals, breakfast lovers will find multiple versions of faves like Eggs Benedict such as ones paired with a basil pesto hollandaise sauce or smoked salmon and spinach with a caper dill hollandaise sauce. Fans of home fries should see the röstis, which are seasoned skillet potatoes topped with a choice of anything from corned beef and cheddar to veggies. Perhaps the most eye-catching option is French Toast Fondue, a twofer serving with cinnamon nutmeg French toast sticks, pretzel sticks, and fruit to be dipped in a warm maple-cinnamon sauce. Plus, they have a separate list for 10 different versions of Bloody Marys and Mimosas! For vegetarians, this small-sized, lunch-only restaurant is big on flavor with inventive dishes. Also on Main Street, The Good Bite Kitchen is able to hold about six counter sit-in diners, as its location was once a storage hallway until opening in July 2012. The menu rotates, but all lunchtime options are cooked there. Find salads and soup, gluten-free optional and vegan bowls such as chickpea and rice stew or green curry broth, and sandwiches served on toasted focaccia, plus a smoothie of the day. For drinks, if it’s there, try the ginger and allspice hot apple cider. On Saranac Avenue, this good breakfast/deli location offers various counter orders like sandwiches, bagels, lunch plates, and salads, plus breads. As a bagel eater, I also found a neat discovery at Saranac Sourdough: a sourdough bagel. I didn’t think that this type of bread could become an oval option. And as far as I know, I’ve never seen a bagel like this before. So of course I had to try it. I did and it was good. A mile east of Lake Placid’s downtown area, this tasting room has many assortments of Swedish Hill Winery whites and reds produced by Swedish Hill Winery, which is based in New York State’s Finger Lakes region. Along with chardonnays, Rieslings, and cabernet francs, finds include Glögg, a spicy red wine with a Swedish influence that features flavors of cinnamon, cloves, cardamom and ginger. Swedish Hill Winery has a sister winery called Goose Watch Winery that has a tasting room, the Goose Watch Lake Placid, on Main Street. This entry was posted in Delta, Food/Wine, New York, New York State, North America, United States and tagged Lake Placid breweries, Lake Placid dining, Lake Placid restaurants, Where to eat in Lake Placid on March 12, 2016 by She Is Going Places. Those who follow the Winter Olympics know that Lake Placid, New York was the host location for the 1932 and 1980 games. Today, Lake Placid still keeps its Olympic legacy to winter sports thriving, and one of the best ways to see this history up close is at the Lake Placid Olympic Museum. The Lake Placid Olympic Museum has a collection of artifacts, memorabilia, and photographs relating to these games plus the Olympians whose names are still recognized today. Of course, Lake Placid’s place in these chapters is acknowledged as well. Olympic memorabilia on display runs from athletic gear to clothing, and, of course, medals. Objects include a selection of attire worn by Team USA during the opening ceremonies, torches, helmets, and equipment. Within this area, the museum will also be ushering in permanent exhibit fixtures. One of them will be focusing on speed skating, a sport that Lake Placid knows well (the village has a speed skating club). Another planned new exhibit involves the Miracle on Ice, the 1980 medal-round match in which the U.S. Men’s hockey team defeated the Soviets. Another noted athlete featured in the museum is Sonja Henie, a Norwegian figure skater who won her second gold medal in Lake Placid. Henie, who became a three-time Olympian, retired from her sport and went on to pursue a film career in Hollywood and appeared in a number of films. She also was a smart businesswoman in that she implemented what we now call “branding” in that her image appeared on various merchandise like dolls. She also appeared on a Wheaties box. Here’s a fact: Did you know that ever since the first Winter Olympics, held in 1924 in Chamonix, France, has competed in each game, to date? Plus Lake Placid native Charles Jewtraw holds the distinction of winning the first gold medal at Chamonix. You’ll see his picture too. Notability also extends to the Shea family. Its three generations participated in the Winter Olympics: the late Jack Shea, the family patriarch who won gold twice for speedskating in the 1932 games; his son, Jim Shea, who competed in the Nordic combined and two cross-country ski races at the 1964 Innsbruck Games; and his grandson, Jim, a 2002 Olympian in skeleton. The Lake Placid Olympic Museum is housed inside the Olympic Center, which also contains the ice rink where the Miracle on Ice occurred. It’s now named the Herb Brooks Arena, after the team’s late coach. It also holds the 1932 Jack Shea Arena and the USA Rink. The building itself overlooks the Olympic Skating Oval, where speed skater Eric Heiden won five gold medals in 1980, and where visitors can pay to skate on today. The museum is open on most days, except Thanksgiving, Christmas, and Iron Man Sunday, a triathlon event. Another symbol from 1980 Winter Games still standing is the Olympic torch. Or more formally called “1980 Olympic Flame Cauldron.” It’s located at North Elba Show Grounds on Cascade Road, where now horse shows are held at the end of June and the start of July. This entry was posted in Attractions, Delta, Museums, New York, New York State, United States and tagged Lake Placid Olympic Museum, Lake Placid Olympics, What to see in Lake Placid, Yonderbox on March 5, 2016 by She Is Going Places. Last week, I headed up to Lake Placid, a village in upstate New York. While seeing much of Lake Placid, I also spent some time exploring the Whiteface Region of the New York State’s Adirondack Mountains. The Whiteface Region is a delight for nature lovers and outdoor sports fans. Whether a summer, winter, or even fall trip is planned , the region has a network of trails that alternate from hiking and mountain biking, to snowshoeing and skiing. Even fishing, particularly for trout, is big here during its season. Yet for those that prefer more of a walking place, consider starting off High Falls Gorge. Located off of NY-86E in Wilmington, about 10 minutes from Lake Placid, High Falls Gorge has self-guided trails at its 22-acre nature park that brings visitors in viewing distance of waterfalls or Adirondack forestry. Located off of NY-86 E in Wilmington, about 10 minutes from Lake Placid, High Falls Gorge runs along the Ausable River. One of the gorge’s three trails coincides with the direction of the river, where you can walk along maintained routes, bridges, and pathways to view waterfalls (in winter, their frozen look is pretty spectacular). The other two trails involve one that is accessible to strollers and wheelchairs, while the other is steeper and a bit uneven. I walked along the yellow, which leads through various steps for viewing four waterfalls and surrounding trees. Before and after going on these trails, head inside the Gorge’s Welcome Center for a bite to eat at the River View Café. This American-style restaurant serves lunch and dinner with five styles of wings, a ton of apps, salads, lunchtime sandwiches and dinner entrees and burgers. Also in the Whiteface Region, serious hikers can make their mark in completing certain ranges hat are like being initiated into special clubs: the 46ers and 6ers. The 46ers refers to the 46 Adirondack High Peaks, which is this amount of mountains that with elevations ranging higher or lower than 4,000 feet. To get a good start, it’s probably best to consider the 6ers. They consist of six Adirondack peaks found at Saranac Lake, which is west of Lake Placid. Plus if you have climbed all six – and provide the dates of each climb and the approximate time of reaching the summit – you’ll get an official member number, patch and sticker. In my next post, I’ll be listing more about my jaunts around Lake Placid. Stay tuned! Editor’s note: Lake Placid CVB invited me as a guest to Lake Placid and Adironacks region. However, my posts are entirely based on my personal opinion. This entry was posted in Adirondacks, Attractions, Delta, New York State, Parks, United States and tagged High Falls Gorge, what to see in the Adirondacks, Whiteface Region Adironacks on February 29, 2016 by She Is Going Places. 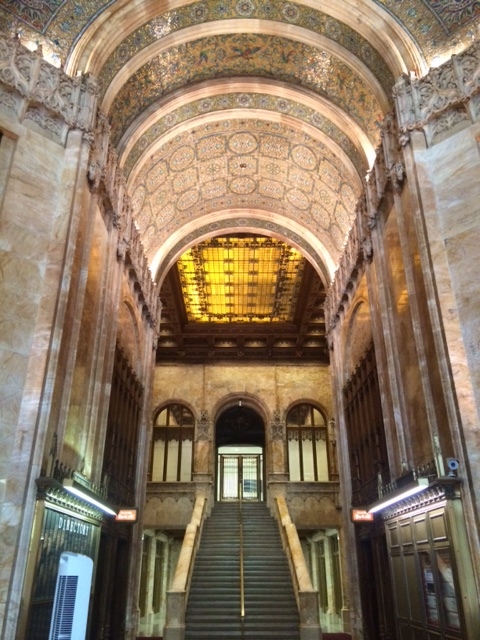 This past Sunday, I was invited as a media guest of WoolworthTours on a tour of The Woolworth Building’s lobby area. Built in 1913, this neo-Gothic-style skyscraper in downtown Manhattan was once the office building for Frank W. Woolworth, founder and owner of the five-and-dime retail chain. For years, workers were able to pass through the lobby of The Woolworth Building — even my WoolworthTours guide in his previous job — but then after 9/11 the area was off limits to the general public. 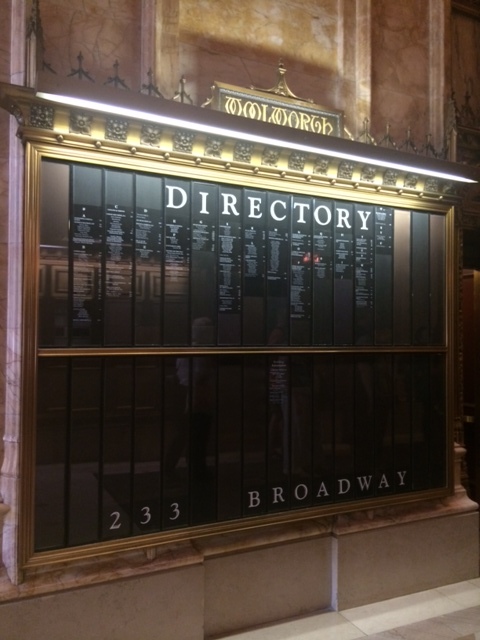 It wasn’t until the building’s centennial two years ago was marked with a gala where talks began about reopening the lobby to the public. The only way you’re allowed to see this area is through the tour, and, from my experience, it’s worth doing so. The Woolworth Tours vary by time (from 20 to 45 minutes) and the sections you’re taken too. I went on the 45-minute tour, which includes the lobby, the lower level and the mezzanine. 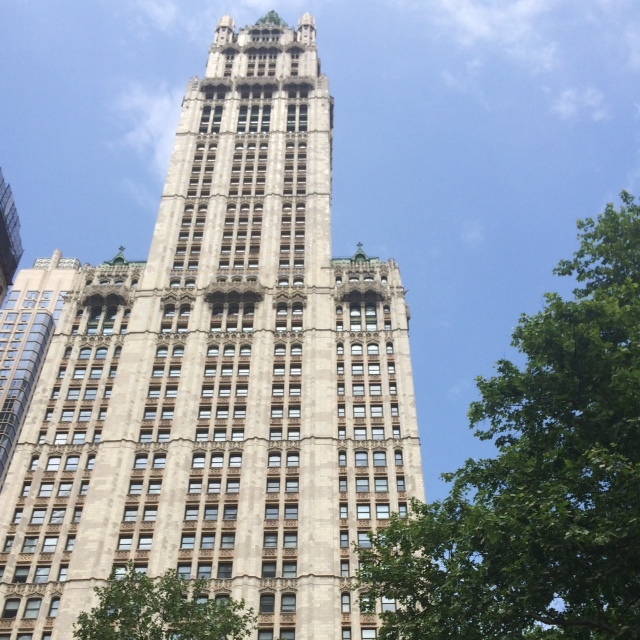 Whatever tour you go on, you’ll hear a history lesson about not just The Woolworth building but also its namesake, Frank Woolworth. According to my guide, The Woolworth Building is literally a monument to Woolworth’s legacy. It’s a visual reminder of his retail empire as his five and dime store spread across the nation and even overseas. Inside the building, you find the exterior as a canvas of fine craftsmanship from ceiling to stairways. Considered to be the tallest building in the world at one point, this structure once contained Irving National Exchange Bank, which financed its construction; a Parisian shopping arcade (we could call it a mall now but there was no Woolworth’s in it); a health club with swimming pool; and a medieval beer house known as a rathskeller that catered to the building’s tenants. Today, its occupants on the lower floors include NYU’s global affairs center, a technology firm and a travel agency. There’s also a chance that the building will hold residents in the future, as an investment group that has purchased the top 30 floors plan to convert the space into luxury apartments and covert the penthouse into a five-level living space. You’ll be pointed to embellishments with Ws along with other markings that show the building’s stance as a center of commerce. And, of course, Woolworth’s own character is reflected here. 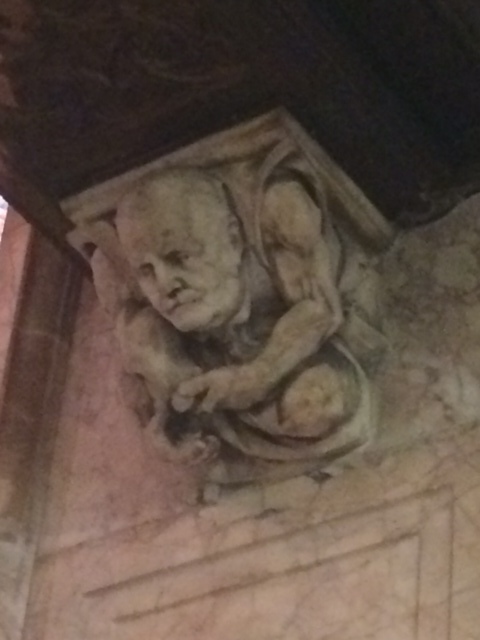 For example, about a dozen or so gargoyles are placed around the interior but they’re not of the usual creatures. Instead, they resemble Woolworth and other key figures involved in the building’s construction. 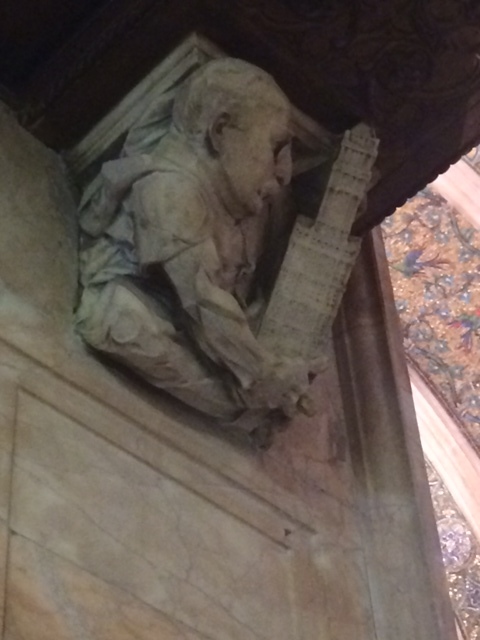 As just as important as Woolworth, architect Cass Gilbert designed the building and he is shown holding with his creation. 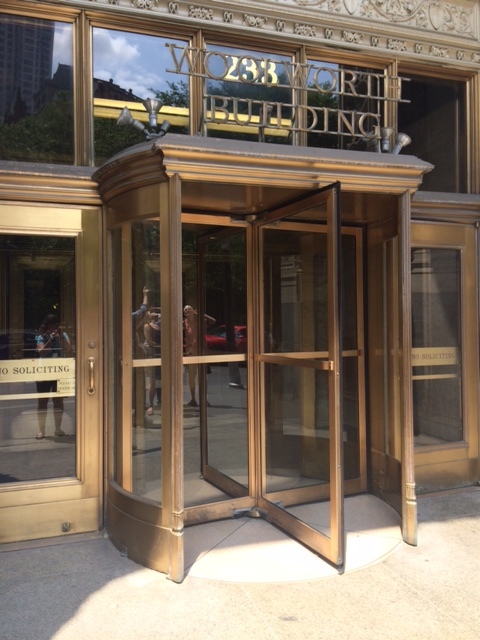 I recommend going on the 45-minute tour as you also get to see the vault of the Irving Bank, which keeps some old safety deposit boxes. There are also neat murals on different period of Colonial New York in this area as well. So definitely see this landmark! 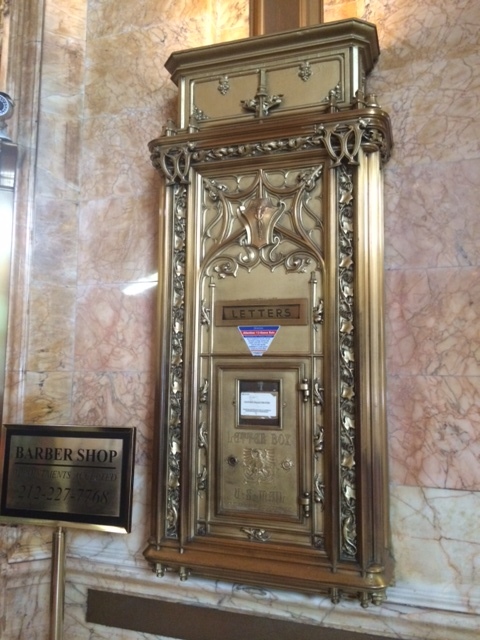 This entry was posted in Historic Places, New York City and tagged The Woolworth Building, Woolworth Tours on June 3, 2015 by She Is Going Places.